This is not an official WinCustomize product.It's fun art by many request. 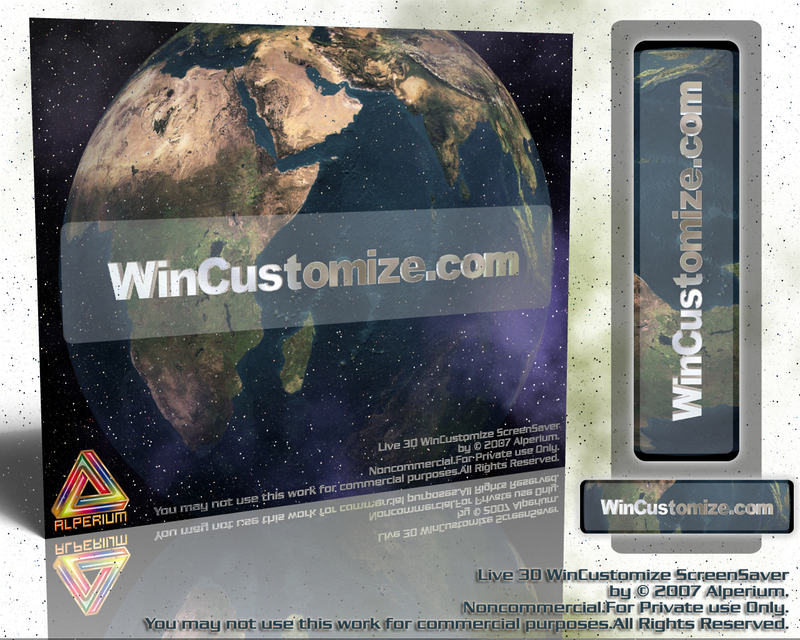 * Realistic 3D Earth model will rotate on your desktop with "WinCustomize.com" caption. * Music (You can add/modify your own playlist). Alperium, this is really well done. Kudos to you. Really nice graphics and transitions, would probably make a great base for a television commercial. To me, the promotion is way too overpowering to use as a screen saver. I wanted to like it, I really did. Installed it, watched it run for a few loops and admired the graphics, began to hate it, then uninstalled it. Maybe if it were more of "an Earth with Wincustomize graphic animations" instead of "Wincustomize graphic animations with an Earth back there somewhere" I could run it as a screen saver. As it is now, no way. Sorry, like I said, I really wanted to like it. I at all have not understood why this my job have featured. I understand that the cycle for ScreenSaver should be more,but it is limited by the sizes. Nobody is necessary ScreenSaver more than 50-60 Mb. And I am limited by technology for their making. Alperium, I think you misunderstood me. I didn't mean it is too short/brief/small, I meant that for me the WinCustomize letters are too big for a screensaver. I would like it much much better if it were exactly the same, but with the "WinCustomize" letters a much smaller size so I could enjoy the Earth more. Again though, it IS a nice piece of work in itself. WinCustomize should buy it from you! WinCustomize should buy it from you! Al, This is a nice tribute. I am amazed with your software it is Super-Fantastic! Just like Me & You! I think this is among the most critical data for me. What's more, I am happy perusing your article. However, need to comment on few general things, The site style is incredible, the articles is extremely incredible .